Topricin Fibro Cream is a Doctor & Pharmacist Recommended soothing combination of natural biomedicines that rapidly relieve pain, while helping the body to heal the damage that is causing pain. Finally, Chronic pain sufferers can experience safe, effective, natural pain relief. Patented and proven to be effective for treating the pains of fibromyalgia, Topricin FIBRO CREAM is specially formulated to help you restore your quality of life. It utilizes a soothing combination of 11-natural biomedicines that rapidly relieves pain while helping your body to heal the cells that cause the pain. Women suffering with Fibromyalgia will love that “Topricin FIBRO CREAM helps to get the first trigger under control so they can enjoy the day as well as sleep better at night. Odorless and grease-less, Topricin Fibro Cream brings a soothing combination of natural biomedicines that rapidly relieve pain while helping the body to heal the damage that is causing pain. Free of Chemicals, No Side Effects, Safe for use by Pregnant Women. 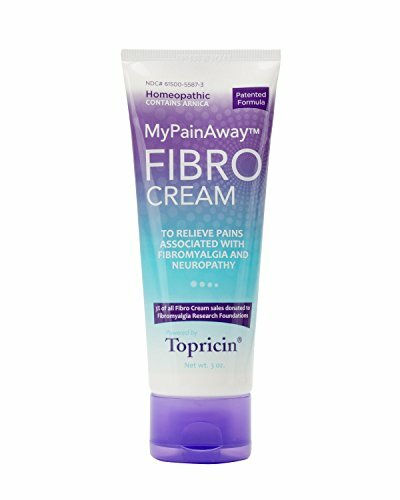 3% profits of Topricin FIBRO Cream are Donated to Fibro Research Foundations Topical BioMedics has been bringing superior, safe, effective pain relief to the Medical and Natural communities, their patients, customers and clients since 1994. DOCTOR AND PHARMACIST RECOMMENDED - Our patented fibromyalgia Pain relief rub is recommended by doctors and pharmacists, because our healing technology works and helps your body relieve pain at the cellular level without negative side effects so you can say goodbye to pain. HELPS REDUCE THE NEED FOR PAIN PILLS - This patented cream for fibromyalgia and neuropathy is effective reducing nerve pain naturally so you can use less pain pills. IMPROVES SLEEP TO RESTORE ENERGY - Naturally reduces pain from fibromyalgia and allow you to sleep better and deeper. Topricin Fibro Cream helps improve your quality of life. View More In Pain Relief Rubs. If you have any questions about this product by Topricin, contact us by completing and submitting the form below. If you are looking for a specif part number, please include it with your message.